The Internet enables limitless sharing of information around the globe, resulting in an effectively near-infinite security threat to governments and organizations as well as to individuals’ personal privacy. While estimates vary, it is possible that $1 trillion in theft occurs via cyberspace every year. 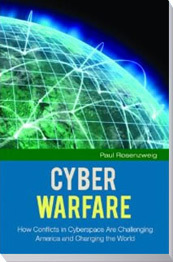 "On a recent flight, I read "Cyber Warfare" by Paul Rosenzweig. Wonderful book. Couldn't put down. Great legal analysis." "Paul Rosenzweig is uniquely qualified to write about our need for the better use of data. Cyber Warfare asks critically important questions about how we can best optimize both security and privacy in a world of increasing threats and information availability."